Throughout 28 years and over 2000 concerts as violist with the Medici String Quartet, Ivo-Jan van der Werff has toured the world, playing in major venues and cities in more than 50 countries on 5 continents as well as playing on over 40 recordings, including the complete Beethoven cycle. He has also recorded viola works by Max Reger and Arnold Bax. With the quartet he has held residencies and taught viola and chamber music at the Universities of Kingston, Lancaster and Surrey in the UK, the Royal Academy of Music in Stokholm, Sweden and the Nan Yang University in Singapore. For 10 years he was a professor at the Royal College of Music, London and now is a full time professor of viola and chamber music at the Shepherd School of Music, Rice University, Houston. Ivo-Jan van der Werff runs his own Summer School for Violists in the Catskill Mountains near New York and has written 'A Notebook for Viola Players', a series of technical exercises and explanations of viola technique. 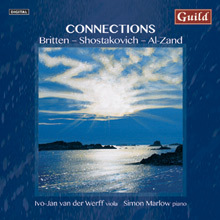 This unique album couples two of the contemporaries who were also staunch musical colleagues. Britten's 'Lachrymae' dates from 1950 and is a fantasy on a song by John Dowland; Shostakovich's Sonata is his very last work, completed in hospital just four days before his death. It is one of the composer's darkest, most moving masterpieces, full of subtle allusions and self-quotations. The recent three-movement work by the Canadian composer Karim Al-Zand, written for Ivo-Jan van der Werff, and receiving its world premiere here, also reflects on earlier music, making this unique coupling one of the most intriguing and suitable in the entire international catalogue. Available for $15 including shipping. Please email me at iv3@rice.edu to purchase a copy. I can take check or credit card.